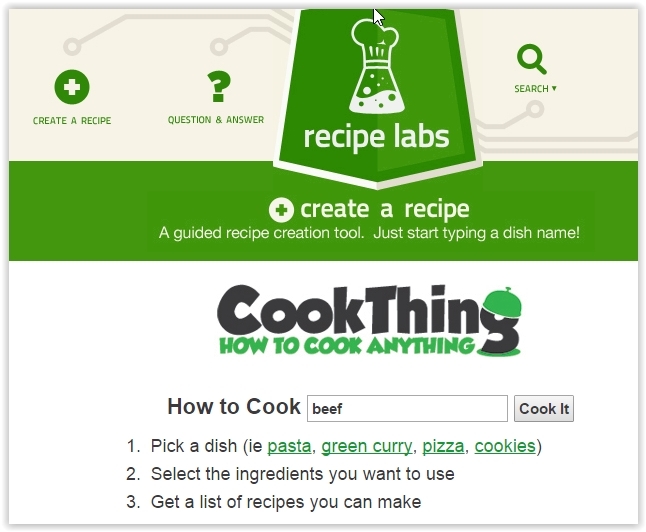 Here is a list of 5 free websites to find recipes by ingredients you have at home. The websites provide you with enough options to satisfy your hunger without going out. We have all heard of recipe books, websites & online lessons, etc. where one can go and learn all kinds of recipes for free. They include all sorts of cuisines and all the other necessary information. However, one feature these websites don’t have is that they don’t let you find recipes by ingredients that you have at home. This is what the websites in this article let you do. You can learn new recipes but without having to go out and buy stuff. Just mention what all you have at home and search recipes accordingly. You may be aware of all the available options, but there is always something new to learn. The 5 websites reviewed in this article are MyFridgeFood, Supercook, Recipe Key, Recipe Matcher, and CookThing. 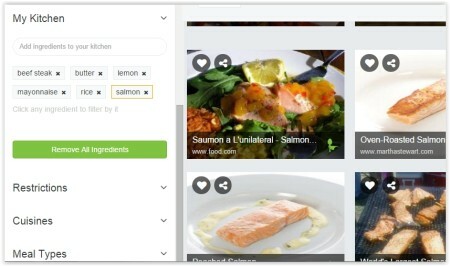 MyFridgeFood is the first website that you can try out to find recipes by ingredients for free. The website has a pretty interesting concept and a good-looking interface. 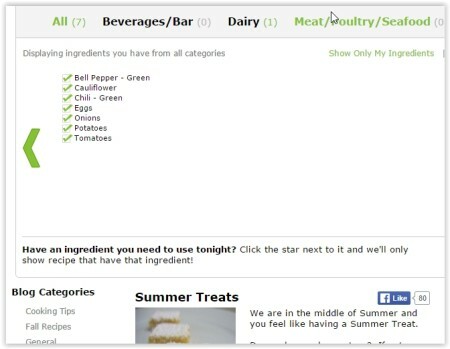 On the home page, it shows you a long list of ingredients that you can choose from. You just have to take a look inside your fridge and tick the ingredients that you have in it. The website makes a list of all the ingredients you have and prepares a list of recipes accordingly. Hit Find recipes and the list will be available to you. All this can be done for free without signing up for any account. However, if you wish to bookmark certain recipes, ingredients, participate in contests, submit your own recipes, then you are required to have an account. You can log in through your Facebook, Twitter, tumbler, account etc. Check out the link above. Supercook is another free and cool website to find recipes by ingredients. Here as well, you can either carry on the search without creating an account, or have a free account if you wish to come back again and again. Supercook shows you recipes in real-time. As you type in the name of the ingredient you have, the website will throw a list of all the recipes you can try. Every time you select a new ingredient, the list throws new options in no time. The website also makes it own suggestions, in case only or two ingredients are missing in your kitchen. You can also emphasize on one particular ingredient by highlighting it. Also the website lets you add restrictions, choose from different cuisines and meal types. Based on your selections the website will only show recipes that suit your demand. All the rest are filtered. Check out the link above. Recipe Key is the third platform listed here to find recipes by ingredients. The website provides you your virtual pantry to add items in it. There is a separate Pantry tab. You have to add items you have in your kitchen from the available options. Once your virtual pantry in full of items you presently have, click to find all the recipes you can make with those items/ingredients. The website also comes with certain filters to help you organize stuff in a better way. 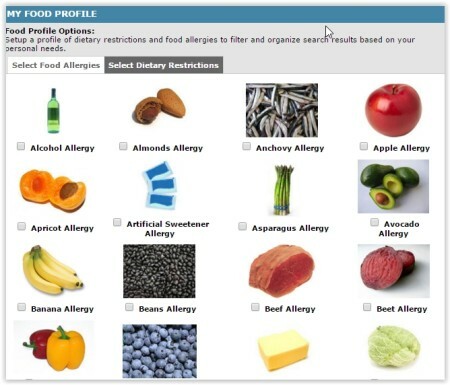 You can go to your food profile tab, and select items that you are allergic to, or want to avoid. The website will make sure not to show recipes that includes allergic or restricted ingredients. Check out the link above to know more. Recipe Matcher is another useful website that can show helpful results based on your selected ingredients. It follows the usual pattern of choosing ingredients and finding recipes accordingly. On the home page of the website you have to choose the ingredients that you have from a long list of available options. 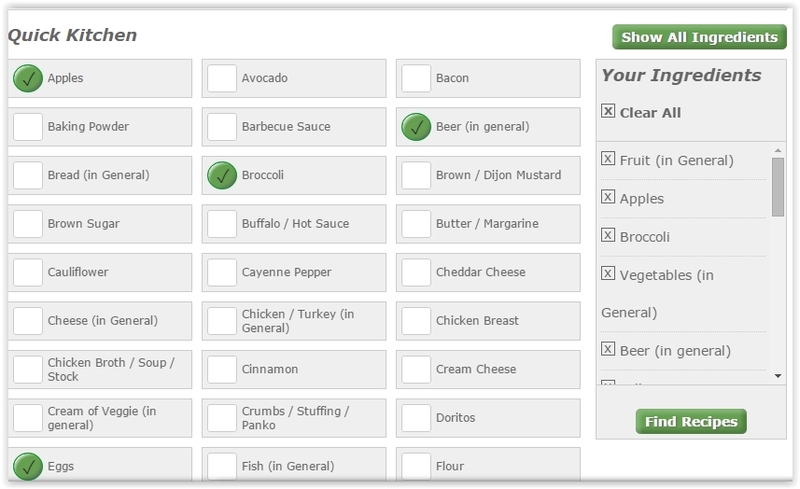 The ingredients shown are from different categories and you can choose from them to have your own list. After you have chosen the ingredients you have, you can hit the option to show only my ingredients. 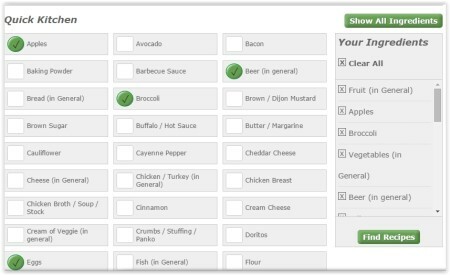 You will then see a list of only those ingredients you have chosen & can also see them in different categories. Once you are satisfied that you have chosen the correct ingredients, start finding recipes that you can make using them. One click is all it takes to find all the recipes the website has to offer. Try out the recipes and also share them with your online friends. Check out the link above to more. 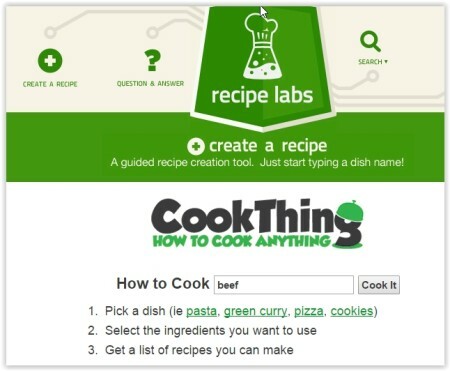 The final website to find recipes by ingredients is CookThing. This website is slightly different from the other websites mentioned in this article. 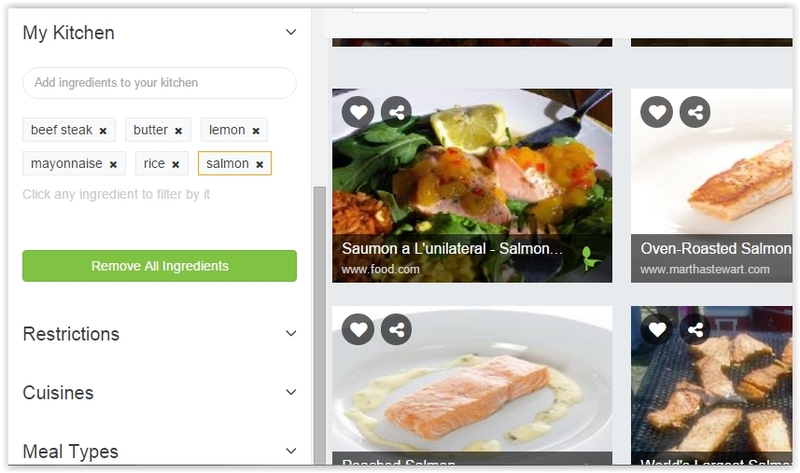 Although the objective of the website is same, i.e., to help you find recipes based on available ingredients, it is different in the way it functions. You are first required to enter a name of dish that you wish to make. After that, the website will show a list of ingredients from which you have to pick the ones you wish to use. Based on the ingredients you choose to use, the website will show a list of recipes you can make. So, for instance, if you wish to make chicken, the website will show you a list of ingredients required to make different types of chicken. Based on the ingredients you choose from that list, the website will show a final list of different chicken recipes you can make. Check out the link above. These websites come pretty handy in situations when you cannot get out and have to be content with whatever you have in your kitchen. Also for beginners, the website has some simple and tasty recipes to offer. Try them out and come back to share your experience with us.